This week, the U.S. Green Building Council (USGBC) announced that Illinois had once again made it to the number one spot on their list of top ten states with the most green building space per capita for the third year running. To rank the states, USGBC pulls data about the number of green buildings constructed in each state and their square footage. LEED certification determines how green a building is. LEED, short for Leadership in Energy & Environmental Design, is a program that has defined rubrics for environmentally friendly and sustainable architectural design, including the use of clean energy, and maximizing available technologies and materials to conserve energy. It’s a detailed, tiered system, so we won’t go into it in too much detail — but architecture buffs can find more information here. LEED certification is probably beyond the kind of work that most of us can afford to make our homes greener (though there is evidence that green technology may raise the value of homes on the real estate market). But by using the technologies available to us, such as smart meters and smart thermostats like the Nest and Rainforest, we can be proud of making our households part of the green trend in Illinois. Speaking of “green,” it feels like we use that word a lot when we’re talking about environmentally-friendly, energy efficient, or renewable — even though these things don’t always look green. So, we enjoyed reading about efforts in Melbourne, Australia to actually be more green, with plants and other vegetation. 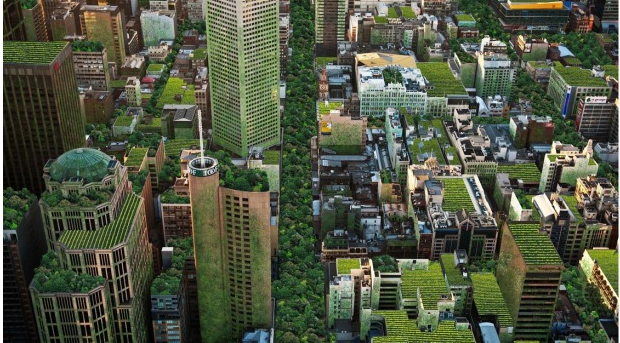 Take a look at these real and imagined green cities.